This is one of my favorite bakingsheet photos of all time, I think. Just looking at the photo reminds me of how delicious these pancakes were and how I wouldn’t mind having another plate-full right now. Going for something healthy for breakfast, I used whole wheat flour and wheat bran in these. I was hoping for something hearty, but not expecting a whole lot in the flavor department. These far exceeded my expectations. Not only were they hearty and satisfying, but they were delicious! I had a packet of freeze dried strawberries that I didn’t know what to do with, so I threw them in. The berries, as it turns out, are nice because they keep virtually forever, but are really only good in cold cereal and pancakes. I liked them better than fresh fruit in pancakes because they were easier to incorporate into the batter and didn’t stick to the griddle. The berries will rehydrate once they’re mixed in, so don’t worry about getting dry, powdery fruit in your pancakes. The strawberries gave the pancakes a lovely boost of flavor. The maple syrup gave the pancakes a nice, natural sweetness and I think that the flavor works excellently with whole wheat. Oil is a fine substitution for the butter in these, though butter will probably give them the best flavor. You don’t need more syrup if you are sensivite to sweetness in the morning or if you choose to use fresh berries in the pancakes instead of dried, but I felt no need to hold back and ate them with more syrup anyway. What is a pancake if not a maple syrup delivery device? Whisk together flour, wheat bran, baking powder, baking soda, salt and allspice in a large bowl. In a small bowl, whisk together buttermilk, milk, egg, butter and maple syrup. Pour into dry ingredients and stir until just barely combined (still lumpy). Quickly stir in strawberries. Some small lumps should remain in the batter. Heat a lightly greased grill or large frying pan over mediu-high heat. Grill is ready when a drop of water will skitter across the surface of the pan. Drop batter in in 3-inch rounds. Cook about 1 1/2 minutes per side, until browned. Second side will take slightly less time than the first side. Serve hot, with maple syrup. Nic, these sound great. I have been looking for a pancake recipe involving wheat, but I’m always afraid they’ll end up being too dry or chalky. I’ll have to give these a try! Delicious and healthy. Looks great Nic. These look so good! I have been looking for strawberry recipes lately and for healthy ones especially… can’t wait to try this! Very nice. I usually only add blueberries but this is a wonderful idea. That pic is amazing. 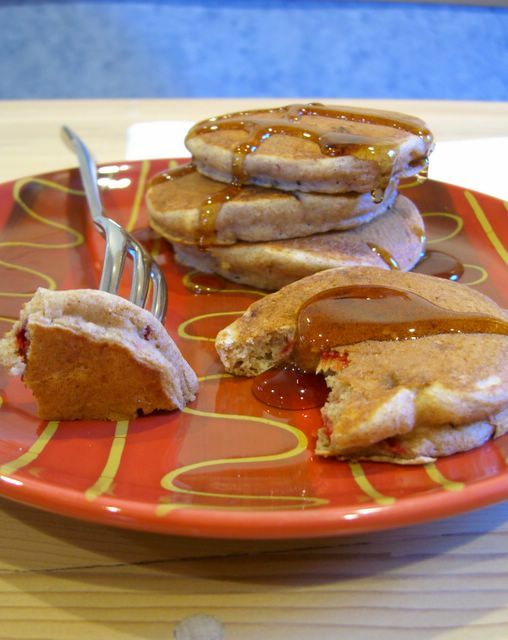 I found your site when I looked up strawberry pancakes and I’m so excited to try this recipe. Do you think it would come out as well without the wheat bran? I don’t have any, and doubt I would use it very often if I went out and bought it. Simply fantastic !!! I recommend this recipe to everyone. Another great recipe. You guys could feature more recipes with plums cause I love them.